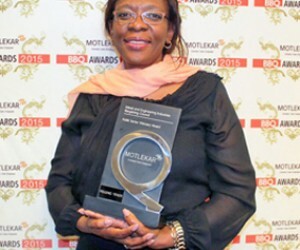 Ms Felleng Yende, CEO of Fibre Processing and Manufacturing (FP&M) SETA won the Public Sector Visionary Award at the 2015 BBQ Awards, held at Emperors Palace on Friday, October 30. 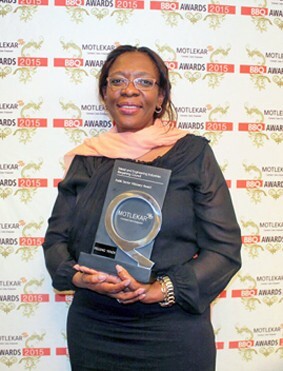 This prestigious award, is the third business accolade linked to outstanding leadership, corporate governance and transformation that Ms Yende has won in as many months. On July 28, she was announced the winner of Africa’s Most Influential Women in Business & Government 2015, by CEO Global, and on August 4 she was awarded the Youth Employment Award SA 2015, by the South African Council for Graduates Co-operative. Ms Yende has been CEO of the FP&M SETA since May 2013. Her primary focus has been to ensure a smooth transition after the amalgamation of three SETAs, whilst simultaneously providing results driven leadership through the development and execution of an innovative business model that she designed, and that was central to the repositioning of the FP&M SETA. The FP&M SETA’s performance in the 2014/15 period increased to 86.2%, from the 64% reported in the previous financial year.